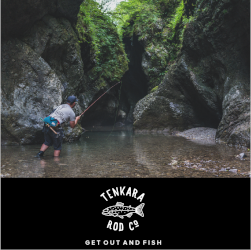 Not too long ago, I wrote a post about my preference for wet wading when tenkara fishing. While it’s great in the summer, with fall fast approaching (even faster in the high country), it’s time to break out the waders for the colder temperatures ahead. 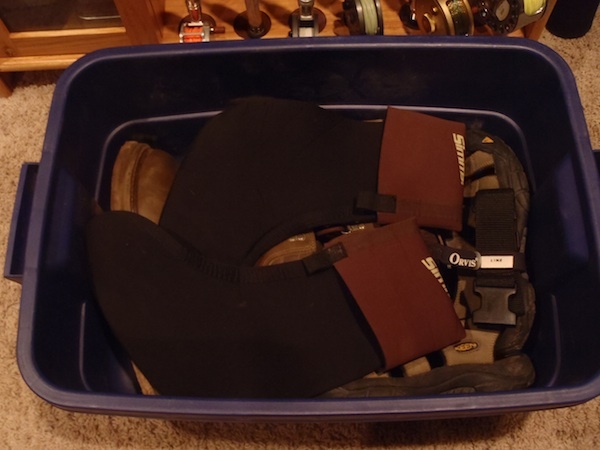 Every angler who uses waders has their own system for storing and transporting their wading gear so I thought I’d show you mine. 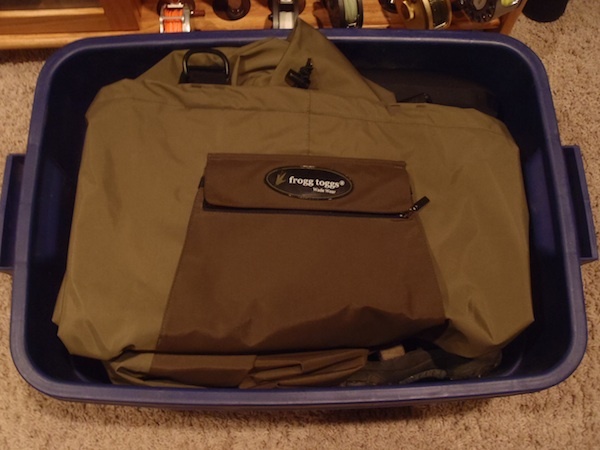 It’s a simple system, yet a very practical one that gives me a lot of versatility in wading options from the trunk to the bank. Many people carry wader bags, and these are OK but I prefer hard-sided plastic containers. They’re easy to hose mud and sand out of, dry quickly, and will never let wet waders or boots leak into your car. Plus, they’re dirt cheap and last forever. 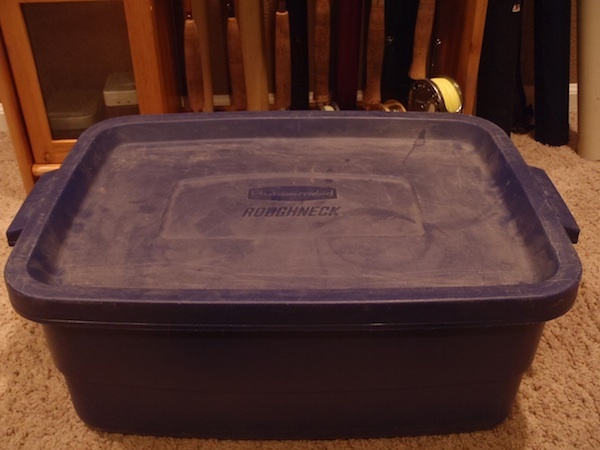 I use a Rubbermaid Roughneck 10 gallon storage box because it has plenty of room to fit everything I need, yet is still compact and flat so I can stack other gear on top of it in the trunk (like my gear bag). First, I put in my Simms wading boots and Keen Newport wading sandals. Then, I put in my wading socks and spare wading belt. In case you’re wondering, I keep a wader repair kit in my gear bag so no need for that here. On top of all of that goes my neatly folder waders. Since the waders are the biggest item and the easiest to take out and put back in, I can access the smaller contents below without having to dig through a lot of gear. In hot weather in a relatively easy-to-wade stream or when I primarily fish from the bank and only need to do occasional water crossings, I can just use the sandals. If it’s warm but I need to be in the water more or am in a stream with a lot of toe-stubbing boulders, I can wear the wading socks and wading boots. In colder weather or where I need wade deeper, I’ve got the option of wearing the full waders and wading boots. Of course, if I only need to fish from the bank, I just wear whatever I drove to the stream or lake in and leave everything above in the car. You never really know what wading gear you’ll need until you get there. It’s just nice to have options. 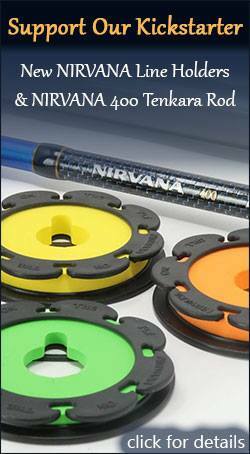 What is your wading gear system? Keep up the great posts, Jason. I use an almost system. Love bins for sports, have one for for fishing, one for camping gear, one for surfing and one for climbing. They stack nicely in the garage. 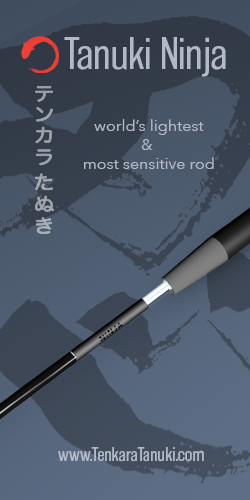 Hope you guys have fun fishing this week. Thanks Daniel! I’m sure we will. Nice to see a fellow bin-o-holic! This is so obvious yet, it never occurred to me. Thanks for the tip. Out with gear bag and in with the container. I notice your Simms boots are felt sole. This summer I stopped at Cabela’s on the way to CO and bought some rubber sole studded boots thinking CO surely is moving away from felt sole. 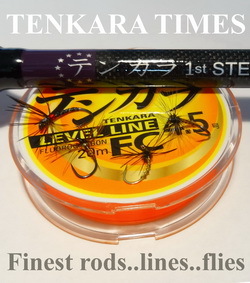 Had a hard time getting any definite answers either on line or in outfitter shops. Boots worked well but I prefer felt. Since I’m traveling, washing felt soles after each stream is a bit of a problem for a van camper. Anyway, what is the official word about felt sole. Which style of Frogg Toggs are those waders? How do you like them? They’re Hellbenders. I haven’t used them yet but will this Saturday. I’ve tried them on and they’re a good fit–very comfortable. Will report back after I actually get them in the water. As far as I know, there isn’t a ban on felt soles in Colorado (yet). Does anyone have information to the contrary? I don’t know about CO, but they are not yet required in MT. The talk on the street is that the legislature will outlaw them in the fall of 2012, but predictions about the MT legislature is like predictions about cats. In Bozeman I saw some boots for sale that had (easily) interchangeable felt and rubberlike soles — the user could use them alternatively, back and forth. The details of your storage box for wader stuff is brilliant. I’d never have thought of using the lid (instead of, for instance, a small piece of carpeting. Carol: Update. Wore the Hellbenders all day today and am impressed. No condensation after about 8 hours of wearing them and very comfortable on the stream. These waders performed better than many waders I’ve had that cost 3X as much. I think I’ll do a review on them soon but initially, I’d say they were a great value. I use a similar approach. Since I grew up canoeing, I’ve always kept a big plastic crate in the back of the car for wets; keeps the car dry, and easy to hose out. No need to for a lid, gets in the way when you are putting wet gear in and its dark and wet. Better to have a an oversize crate than just the right size. Easier to dump wet gear in, and also works for gear from kids or friends when they are with you. My other suggestion is to establish a drying rack in the garage beside the car, with hangers ready for hanging up the gear on arrival. BTW, the empty crate works well for shopping too, stops it rolling around the back of the van/truck. I.ve always used gear bags and an old tarp. I like the idea but since the family rules are everything that is remotely damp comes out of the car and gets hung up to dry in the shed, it doesn’t really help me much. Besides, more often than not, I use hip waders when I can’t wet wade. They keep me from being stupid in the winter. I just use the bin to transport my wading stuff and keep it from messing up my car. As soon as I get home, I take everything out and hang it to dry like you, then put it back in the box for storage. Like the comments about hip waders in winter. I should probably do that. Great site!!! 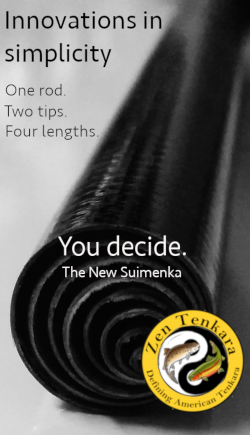 I’m new to Tenkara and am using all of your input to make decisions about the equipment/gear I purchase to get started. 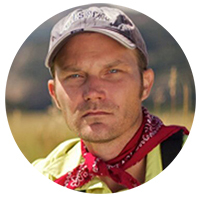 I’m curious what your thoughts are on waterproof hiking boots (+ gaiters and or waders) versus wading boots. I’m in Colorado as well. Thanks! You could use hiking boots but you’ll probably want to add studs for traction. Also, most gaiters and waders have a relatively thick neoprene foot which would make for a tight fit so you might have to use a boot that is a bigger size than you normally wear. Which might be bad for hiking. I guess you have to experiment a little with different combinations to see what works. Thanks Jason! I just happen to have a pair of the boots I like one size above my normal size. 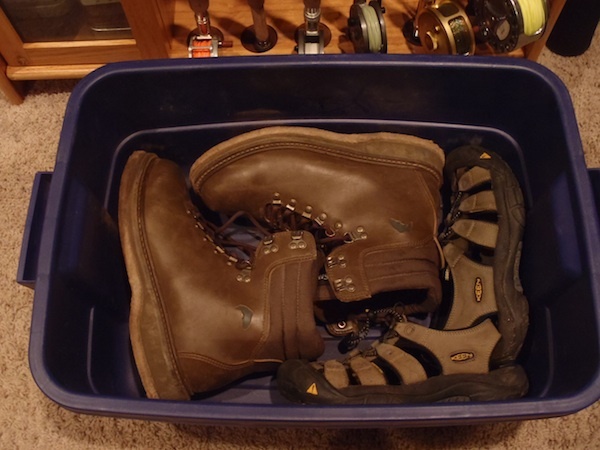 I figure I can always add an insert to take up the extra space when hiking (so long as they could double for wading boots).